Brexit, a global economic slowdown, and trade uncertainties are all contributing to stronger precious metal prices. It also helps that within Basel III, gold is categorized as a risk-free asset. Basel III is a set of international banking regulations developed by the Bank for International Settlements to promote stability in the international financial system. This set of tougher rules (compared to its predecessors of Basel I and Basel II) were developed in light of the financial crisis of 2007/2008. Basel III encourages banks to take lower risks; it suggests that banks maintain a capital ratio of at least 8%. The capital ratio measures a bank’s capital in relation to its risk-weighted assets. Cash and gold are viewed as assets with zero risk. One stock that benefits from higher precious metals prices is Wheaton Precious Metals (TSX:WPM)(NYSE:WPM). Back in October, I recommended buying the stock for portfolio protection. The stock has done more than that. Specifically, Wheaton Precious Metals have appreciated 45%, handily beating the TSX index and Canadian market by about nine times! In fact, it’d be difficult to find another TSX index stock that has done so well since October. Wheaton Precious Metals is probably the best silver stock and one of the best precious metals stocks to own. It’s a precious metal streaming company, which means it doesn’t operate any mines. This is a big factor for its high-margin business. The company pays an up-front cost to its mining partners around the world for future streams in their byproduct silver or gold. For example, typically its partners operate lead, zinc, or copper mines. The result for investors is a rare opportunity to invest in low-risk Wheaton Precious Metals, which has leverage to increases in silver or gold prices as well as growth via new stream agreements. Currently, Wheaton Precious Metals has streaming agreements with 19 operating mines. 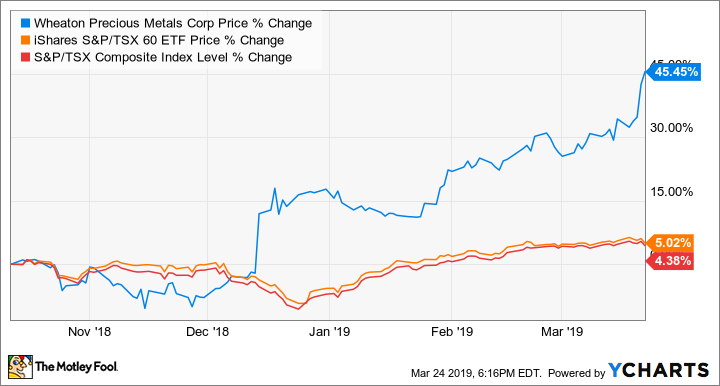 Wheaton Precious Metals enjoys a net margin of about 33%, which sets it apart from industry peers — the industry average net margin is only about 6%. You’d be thrilled to know that despite the run-up of the stock, Wheaton Precious Metals is still miles away from the analyst consensus target. Specifically, Thomson Reuters has a 12-month target of US$29.50 per share on the stock, which represents more than 20% near-term upside. If you’re worried about Brexit, a global economic slowdown, trade talks, or other uncertainties, you should consider buying Wheaton Precious Metals now and especially so on any pullbacks. The fabulous company also offers a dividend, which is currently good for a 1.8% yield. Fool contributor Kay Ng has no position in any of the stocks mentioned. Wheaton is a recommendation of Stock Advisor Canada.